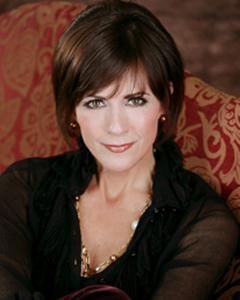 Since 1978, Colleen Zenk has continuously portrayed Barbara Ryan on the CBS daytime drama, As The World Turns. In 2001, she earned her first Emmy nomination for Supporting Actress followed, in 2002, with a nomination in the Lead Actress category. Soap Opera Digest named her Villain of the Year in 2003. Zenk Pinter has worked professionally since the age of nine, and majored in theatre at The Catholic University of America. She has toured with the Army Special Services in Europe performing for our troops; danced with the Metropolitan Opera in the American premiere of A Village Romeo and Juliet at the Kennedy Center; and starred in national touring productions of They’re Playing Our Song, Can-Can, Where’s Charley?, The Star-Spangled Girl and Barefoot in the Park. She made her Broadway debut in Bring Back Birdie, starring the legendary Donald O’Connor and Chita Rivera. Her film debut in the movie musical Annie followed, directed by the great John Huston. For NBC, she starred in the film, Woman on the Ledge. In 2002, she was in the original cast of the workshop production of Portraits at the Ridgefield Playhouse in Connecticut. In 2006, she returned to the musical theatre stage for the first time in over 20 years, in Hello, Dolly!, starring as the indomitable Dolly Levi at the Bucks County Playhouse in Pennsylvania. Last summer, she portrayed Phyllis Rogers Stone in Follies, for the 50th Anniversary Season of The Little Theatre on the Square, in Sullivan, Illinois, opposite her husband, actor and writer Mark Pinter. The Pinters have lived in Connecticut for over 20 years. They are the parents of six children, four girls and two boys. Zenk Pinter was born in Barrington, IL. Her birth date is January 20. Along with her artistic accomplishments, Zenk Pinter has also devoted herself to benevolent and philanthropic organizations including the Easter Seals, March of Dimes and the Cystic Fibrosis Foundation. They served on the board of directors for Bread and Roses, one of the very first HIV/AIDS hospice programs to be established in the northeast. They also served as co-chairs of the Capital Campaign Committee for the Mark Twain Library, helping to raise nearly four million dollars for its restoration and endowment. Early in 2007 Ms. Zenk Pinter was diagnosed with oral cancer. After radiation treatments and surgery to remove the malignancy from her tongue and rebuild it, she has made a full recovery returning to her role on ATWT. Since her experience with this disease she has formed a partnership with the Oral Cancer Foundation to help create public awareness and help spread he word about the need for early detection through an annual screening process. She has appeared in TV interviews on CBS’s Early Show where she was interviewed by Hannah Storm, done print interviews with entertainment related publications, and film TV Public Service Announcements on the risk of oral cancer, which are being currently aired on CBS. In January 2008 she has agreed to film a 60 second TV PSA with OCF for mass distribution to stations across the US detailing the risks of oral cancer. One of the most exciting developments of her public outreach work was a collaboration with the producer of As The World Turns to have her character Barbara develop oral cancer in the story line. Art imitates life. “The importance of this in the pubic awareness arena cannot be overstated”, said Brian Hill of the foundation.Told with technical accuracy, the oral cancer issue will receive public attention for what will likely be many weeks of exposure on a daily TV show, as her character moves from diagnosis and the associated emotional issues, to treatments, and recovery. For a disease that has very low public awareness, this prolonged exposure of it in a mainstream daily TV series performs a valuable function in increasing public knowledge about a very dangerous and deadly disease. While her survivorship will involve many years of constant monitoring as this disease reoccurs far too often, OCF wishes to thank Colleen for her willingness to openly discuss her disease and the very personal aspects of it with the public. Her openness and courage to stay engaged in an emotionally painful aspect of her life to help others, makes her a hero in the foundation’s eyes.